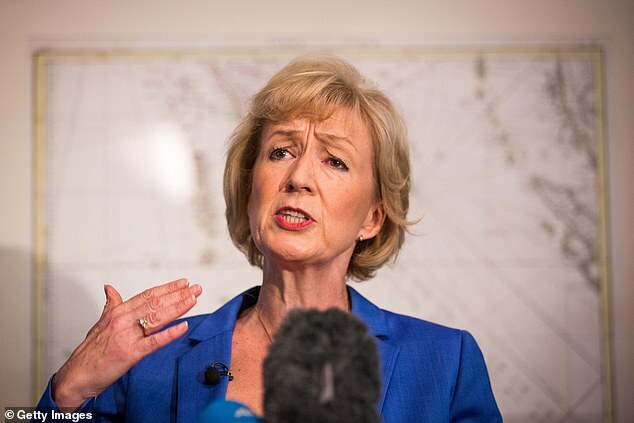 Andrea Leadsom has ratcheted up pressure on the Prime Minister to ditch HS2, expressing fears that the business case for the rail link ‘may no longer exist’. In the latest sign of mounting opposition to the scheme at the heart of government, the House of Commons leader revealed growing concerns about spiralling costs. Downing Street yesterday insisted HS2 is on track and on budget. But a letter written by Mrs Leadsom to HS2’s boss Mark Thurston outlined the ‘absolute dismay’ felt by some of her constituents in South Northamptonshire. HS2 is set to carve through the region without stopping there while on its route from London to Birmingham. The letter, dated January 31, was written following the admission by HS2’s former chairman Sir Terry Morgan to the Lords Economic Affairs Committee that ‘nobody knows’ what the final cost of the high speed rail link will be. Mrs Leadsom said she had been contacted by several constituents who were ‘incredulous’ at the statement, as well as Sir Terry’s ‘refusal to reject’ the assertion by the committee’s chairman Lord Hollick that billions more will have to be spent on HS2 for it to deliver the benefits promised. 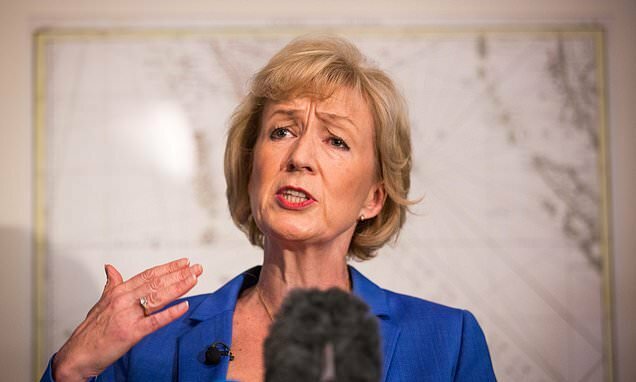 Mrs Leadsom is said to be part of mounting opposition in government against HS2, alongside Theresa May’s effective deputy David Lidington and Chief Secretary to the Treasury Liz Truss. A Dispatches investigation aired by Channel 4 last night claimed ministers are so alarmed by HS2’s price that they are ‘increasingly minded to kill off the scheme’. The report claimed ministers fear HS2 will cost up to £6billion a year over the next decade – equivalent to Network Rail’s annual budget to maintain and upgrade Britain’s entire rail infrastructure. It also suggested officials believe HS2 easily exceed its current £59billion budget. Mrs Leadsom’s letter raised Mr Thurston’s admission that HS2 may run slower and less frequent trains in order to save costs and stick to its £56billion budget. Last month it emerged that officials have considered plans to lower train speeds of up to 225mph by around 30mph and reduce the number of trains per hour in both directions from 18 to 14. Mrs Leadsom said her constituents had warned that if the speed of the HS2 line was reduced to 186mph – in line with the top speed for Eurostar – this would shave just 15 minutes from the current journey time between London and Birmingham on the West Coast Main Line. HS2 had promised to cut the time taken for this journey by about half an hour, from one hour 21 minutes to 49 minutes. Mrs Leadsom wrote: ‘You will appreciate why my constituents – who are directly affected by the construction and operation of HS2 but will see no benefit – are increasingly concerned that the business case is being undermined from all angles, and the basis for which Parliament gave its support to the project may no longer exist.’ Although the first leg of HS2 from London to Birmingham has been approved by Parliament, the next stage to link it to the North has yet to be put to a vote. Transport Secretary Chris Grayling recently claimed that stopping HS2 at Birmingham would be a ‘betrayal’ of the Midlands and the North. Liz Truss raised speculation over the future of HS2 last month after declaring that the Government must be prepared to ‘junk white elephant projects’. But yesterday the Prime Minister’s spokesman dismissed claims that HS2 could be scrapped or scaled back, and said the organisation was working to control costs. 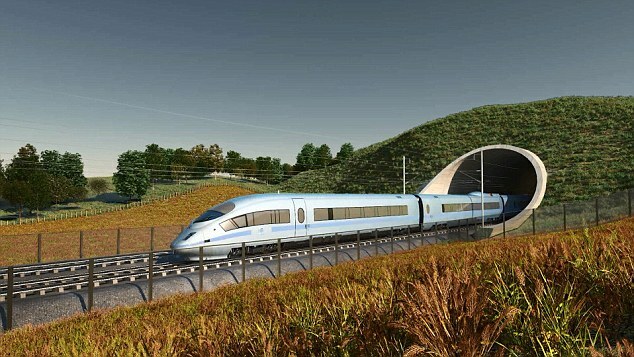 Rachael Maskell, Labour’s rail spokesman, said the Department for Transport needs to ‘get a grip on HS2’s costs urgently’ and set out a detailed plan for the costs for MPs to review.